How well do you know your Batman villains? This is the Two Face of crabapples. There is an explanation for Two Face, and it doesn’t involve acid. Many crabapples are really two trees – a flowering “top” grafted to a rootstock of a different crabapple or apple variety. I don’t like to plant grafted crabapples because the roots send up aggressive suckers, or branches, from the ground which need to be pruned off several times a year. They seem to start re-growing even as you are carrying the branches over to the brush pile. If you don’t prune the rootstock suckers off they can grow to be large trunks with different leaves and flowers than the “top” – and always uglier. Non-grafted crabapples are available. These don’t sucker as much as grafted crabapples do. A tree trunk that grows up from the rootstock can be as large or larger than one growing as part of the desirable “top” of the tree. They are easiest to spot when the tree is in flower because the rootstock trunk has few, if any, flowers. If the variety is one with a reddish tint to the leaves, the rootstock trunk sticks out because its leaves are green. But this giant Two Face is different. You can’t tell from this picture, but it has flowering and non-flowering branches coming from the same trunk, well above the point that you would normally have a graft. What’s going on here? There’s another type of mutant branch that can form on a crabapple – a watersprout. These are very vertical branches that shoot straight up at unnatural angles from the normal branches. Watersprouts grow fast and quite often don’t flower. They should be pruned off, but unfortunately this seems to induce even more to grow from the spot where the pruning cut was made. You just have to keep after them. This particular tree has a very large non-flowering trunk, and several large non-flowering branches on an otherwise normal trunk.My guess is that the non-flowering half the tree in this picture is an old, giant rootstock sucker – with a few watersprouts thrown in for good measure. 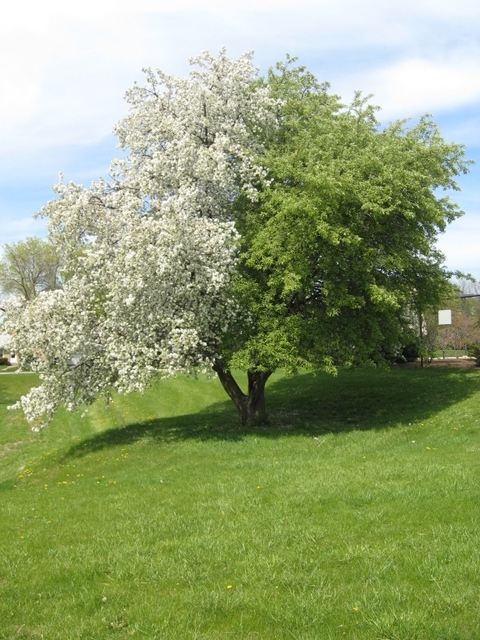 Crabapples can be outstanding landscape trees, well adapted to our harsh climate and clay soil. But they do require some attention to pruning. You don’t want to end up with Two Face.